The lipstick tree (Bixa orellana is a good example of the potential for the Amazon to provide useful products from native plants. It is called the lipstick tree because its fruit provides coloring that can be used as body decoration, food coloring and medicinal uses. And this is just one plant out of 50,000 known species from the Amazon. Who knows what else might exist out there, yet to be discovered? The fruit of the lipstick tree when fresh produces a bright red cream used for body decoration and food coloring. It is a common food additive in natural food products, where it is listed as annato among the ingredients. 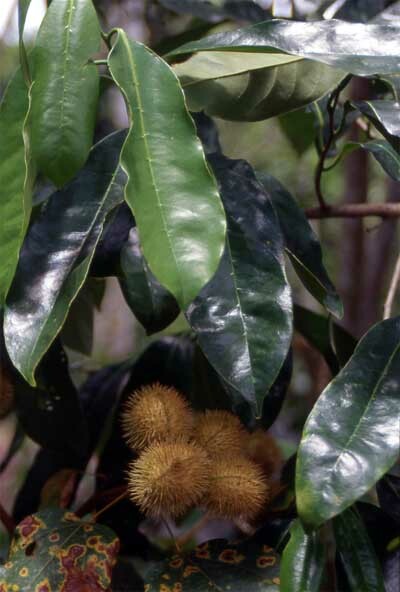 This picture shows leaves and unripe fruits of Bixa orellana. The plant grows to the size of a small tree. All above-ground parts of the plant have medicinal uses: too many to mention here. 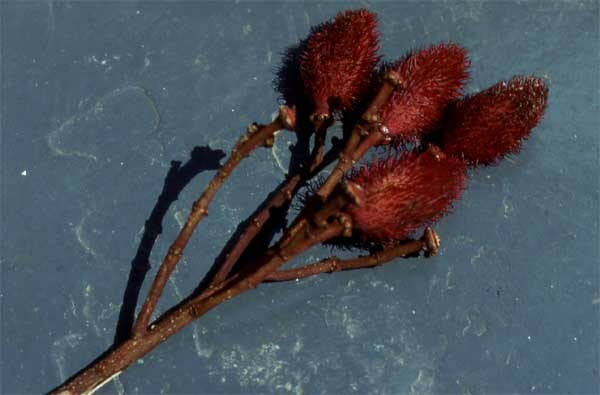 For example, leaves and shoots are used to treat skin problems and hepatitis. The blotches on the leaves in the bottom of the picture appear to be some kind of diseasebut the pods are unaffected.